[S746] Wikipedia, online http://Wikipedia.com, http://en.wikipedia.org/wiki/John_Cathanach_MacDonald,_4th_of_Dunnyveg. [S924] Rev. George Hill, The MacDonnells of Antrim, page 33. Biography*: Sir Donald 'Ballach' Macdonald was born circa 1407. He was the son of Ian 'Mor' Macdonald, Lord of the Isles and Margery Byset. He married, firstly, Johanna O'Neill, daughter of Con O'Neill of Edenduffcarrick. He married, secondly, Joan O'Donnell, daughter of unknown O'Donnell, Lord of Tyrconnel. He died in 1476. He held the position of Chief of Clan Ian Mhoir. Sir Donald 'Ballach' Macdonald also went by the nick-name of Donald 'Ballach' (or in English, 'the Freckled'). In 1431 he was the commander of the rebellion in the Isles, invaded Lochlaber, defeated the King's army under the Earls of Caithness and March, and ravaged the adjacent districts, then withdrew to his mother's lands in Ulster. Domhnall Ballach, also known as Donald Balloch MacDonald (d. c. 1476) was a son of Iain Mòr Tànaiste MacDhòmhnaill and Margaret Bisset, daughter of MacEoin Bisset, Lord of The Glens. He was the second chief of Clan MacDonald of Dunnyveg. He succeeded to the chieftainship of the clan after his father was murdered by James Campbell after a scheduled meeting at Ard-du, Islay in 1427. Donald took revenge and James Campbell was executed, protesting however, that it was done under the King James I of Scotland's order. Known as a military leader he was chosen to lead Clan Donald and defeated the forces of King James I at the battle of Inverlochy in 1431. Subsequently after a number of defeats against Royal forces Donald was forced to flee to Ireland. A pickled head was presented by his friend, the Irish Chief Hugh Buy O'Neill, who presented it to the King James I, as that of the rebel Lord of Dunnyveg. After the death of King James I, Donald returned to Dunnyveg in 1437. He died on an islet upon Loch Gruinart, Islay in c. 1476. Margaret, b. c. 1414 married Ruari MacDonald, 3rd of Clan Ranald. [S746] Wikipedia, online http://Wikipedia.com, http://en.wikipedia.org/wiki/John_Mor_MacDonald,_3rd_of_Dunnyveg. Biography*: Margery Byset (Bisset, Bissett; also Marjery, Margaret, Marie) was an Irish noblewoman belonging to the Bissett family whose marriage to John Mór Tanister MacDonnell in 1399 laid the basis for the Clan Donald claim to the Glens of Antrim, the lordship of which her family had established in the 13th century. She is the ancestress of the Clan MacDonald of Dunnyveg and their powerful descendant sept the MacDonnells of Antrim, through whom she is an ancestor of many of the Irish and British nobility and royalty living today. Margery appears to have been the daughter of the Mac Eoin Bissett, Lord of the Glens, and Sabia O'Neill (died 1387), a princess of the O'Neill dynasty. This is all that is relatively certain, however, because no medieval Bissett pedigree has survived, the family falling from power in the Glens of Antrim in or not long after 1522, following the Battle of Knockavoe, and not being recorded by Duald Mac Firbis in the mid-17th century except in reference to their maternal kin the MacDonnells, who replaced them. Mac Firbis uniquely describes the Bissetts as being of Greek origin, first arriving in England with William the Conqueror. As far as Margery's likely mother Sabia it is possible she was one of the four daughters of Aodh Reamhar Ó Néill, King of Ulster, whose names were unknown to the 19th century genealogist John O'Hart, the O'Neill pedigrees themselves being imperfectly preserved. Possibly some time before, or around the time of her marriage to John Mór Tanister, Margery met Richard II of England when he was in Ireland, either during his 1394–1395 campaign to receive the submission of a number of the Irish princes, or later in 1399, the year in which he was deposed. She was "no doubt presented to him, as the daughter of a great northern lord", and retained a memory of his face. After she had come to reside with John in the Isles, the contemporary Scottish poet Andrew of Wyntoun tells of her recognition of a man whom she believed to be the deposed king travelling [dressed] as a poor man. Although Richard is widely believed to have starved to death in captivity in Pontefract Castle in early 1400, Margery vouched for the man, whomever he may have been, and the Scots believed her. He was naturally dismissed as an impostor by Henry IV, but had a kind of career as an anti-Lancastrian figurehead anyway and died in 1419. [S924] Rev. George Hill, The MacDonnells of Antrim, page 22. Name Variation: Guy O'Cathan was also known as Irish Lord of Limvady. Biography*: He succeeded to the title of Comte de Provence in 1209. 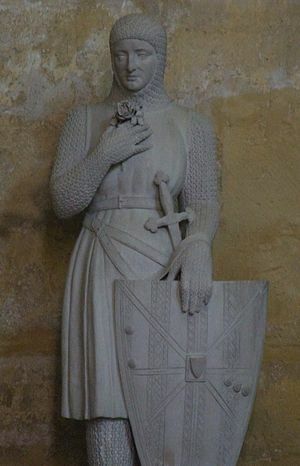 Ramon Berenguer IV or V (1198 – 19 August 1245), Count of Provence and Forcalquier, was the son of Alfonso II of Provence and Garsenda de Sabran, heiress of Forcalquier. He was the first Count of Provence to live in the county in more than one hundred years. After his father's death (1209), Ramon was imprisoned in the castle of Monzón, in Aragon until he was able to escape in 1219 and claim his inheritance. He was a powerful and energetic ruler who added Forcalquier to his domain. He and his wife were known for their support of troubadors, always having some around the court. He was known for his generosity, though his income did not always keep up. He wrote laws prohibiting nobles from performing menial work, such as farming or heavy labor. Ramon had many border disputes with his neighbors, the Counts of Toulouse. In 1226, Ramon began to reassert his right to rule in Marseille. The citizens there initially sought the help of Ramon's father-in-law Thomas, Count of Savoy in his role as imperial vicar. However, they later sought the help of Raymond VII, Count of Toulouse. In 1228, Ramon supported his father-in-law in a double-sided conflict against Turin and Guigues VI of Viennois. This small war was one of many rounds intended to more firmly establish control over trade from Italy into France, and Provence included several key routes. While the Albigensian Crusade worked in his favor against Toulouse, Ramon was concerned that its resolution in the Treaty of Paris left him in a precarious position. Raymond turned his troops from fighting France to attempting to claim lands from Provence. When Blanche of Castile sent her knight to both Toulouse and Provence in 1233, Ramon entertained him lavishly, and the knight left well impressed by both the count and his eldest daughter, Margaret. Soon after, Blanche negotiated the marriage between Margaret and her son, Louis, with a dowry of ten thousand silver marks. Ramon had to get contributions from allies for a portion, and had to pledge several of his castles to cover the rest. Ramon and Beatrice travelled with their daughter to Lyon in 1234 to sign the marriage treaty, and then Margaret was escorted to her wedding in Sens by her uncles from Savoy, William and Thomas. Shortly after, William began negotiating on Ramon's behalf with Henry III of England to marry Eleanor. Henry sent his own knight to Provence early in 1235, and again Ramon and his family entertained him lavishly. Henry wrote to William on June 22nd that he was very interested, and sent a delegation to negotiate the marriage in October. Henry was seeking a dowry of up to twenty thousand silver marks to help offset the dowry he had just paid for his sister, Isabella. However, he had drafted seven different versions of the marriage contract, with different amounts for the dowry, the lowest being zero. Ramon shrewdly negotiated for that option, offering as consolation a promise to leave her ten thousand marks when he died. In 1238, Ramon joined his brother-in-law, Amadeus IV at the court of Frederick II, Holy Roman Emperor in Turin. Frederick was gathering forces to assert more control in Italy. Raymond VII of Toulouse was also summoned, and all expected to work together in the war. In January 1244, Pope Innocent IV decreed that no one but the pope could excommunicate Ramon. In 1245, Ramon sent representatives to the First Council of Lyon, to discuss crusades and the excommunication of Frederick. Ramon died in August 1245 in Aix-en-Provence, leaving the county to his youngest daughter. On 5 June 1219, Ramon married Beatrice of Savoy, daughter of Thomas I of Savoy. She was a shrewd and politically astute woman, whose beauty was likened by Matthew Paris to that of a second Niobe. The wedding also provided the 14 year old Ramon with a powerful father-in-law to aid him in establishing his authority and protecting his interests. Their children included four daughters, all of whom married kings. His daughters were all educated and literate. Ramon Berenguer IV died in Aix-en-Provence. At least two planhs (Occitan funeral laments) of uncertain authorship (one possibly by Aimeric de Peguilhan and one falsely attributed to Rigaut de Berbezilh) were written in his honour. [S746] Wikipedia, online http://Wikipedia.com, https://en.wikipedia.org/wiki/Ramon_Berenguer_IV,_Count_of_Provence. [S746] Wikipedia, online http://Wikipedia.com, http://en.wikipedia.org/wiki/Ramon_Berenguer_IV,_Count_of_Provence. Biography*: Beatrice of Savoy (1205 – 4 January 1267) was the daughter of Thomas I of Savoy and Margaret of Geneva. She was Countess consort of Provence by her marriage to Ramon Berenguer IV, Count of Provence. Her paternal grandparents were Humbert III, Count of Savoy, and Beatrice of Viennois. Her maternal grandparents were William I, Count of Geneva and Beatrice de Faucigny. Beatrice of Savoy's mother, Margaret was betrothed to Philip II of France. While Margaret was travelling to France for her wedding, she was captured by Beatrice's father, Thomas. He took her back to Savoy and married her himself. Thomas' excuse was that Philip II was already married, which was true. Beatrice was the tenth of fourteen children born to her parents. Her siblings included: Amadeus IV, Count of Savoy, Thomas II of Piedmont, Peter II, Count of Savoy, Philip I, Count of Savoy, Boniface of Savoy, Archbishop of Canterbury, Avita the Countess of Devon and Margherita of Savoy wife of Hartmann I of Kyburg. Beatrice betrothed on 5 June 1219 to Ramon Berenguer IV, Count of Provence; they married in December 1220. She was a shrewd and politically astute woman, whose beauty was likened to that of a second Niobe by Matthew Paris. Ramon and Beatrice of Savoy had four daughters, who all lived to adulthood, and married kings. Their only son, Raymond died in early infancy. Beatrice came to England to see her third daughter Sanchia wedded to Richard, 1st Earl of Cornwall, brother-in-law of Eleanor and did much to strengthen the bond between Richard and Henry III. She further strengthened the unity of the English royal family by convincing Henry III to help pay the debts of his sister Eleanor and her husband Simon de Montfort, who had previously often be at odds with Henry. Beatrice's husband Ramon Berenguer IV was detained by state difficulties which his wife solved by getting a loan from her son-in-law Henry III of four thousand marks. When Ramon Berenguer had died on 19 August 1245, he left Provence to his youngest daughter. Beatrice's daughter and namesake then became one of the most attractive heiresses in medieval Europe. Various suitors had tried to seize her, so Beatrice of Savoy placed the younger Beatrice in a safe fortress, secured the trust of its people then went to the Pope for his protection. In Cluny during December 1245, a secret discussion, between Pope Innocent IV, Louis IX of France, his mother Blanche of Castile and his brother Charles of Anjou, took place. It was decided that in return for Louis IX supporting the Pope militarily, the Pope would allow Charles of Anjou, youngest brother to the French King, to marry Beatrice of Provence. But Provence was to never go to France outright through Charles. It was agreed that if Charles and Beatrice had children, the county would go to them; if there was no issue, then the county would go to Sanchia of Provence. If Sanchia died without an heir, Provence would go to the King of Aragon. The generally good relationship between the four sisters also did much to improve the relationship of the French and English kings. It brought about the Treaty of Paris, where differences were resolved. Beatrice and all her four daughters participated in the talks. Biography*: Alfonso II (1174 – 1 December 1209) was the second son of Alfonso II of Aragon and Sancha of Castile. His father transferred the County of Provence from his uncle Sancho to him in 1185. Alfonso II was born in Barcelona. In 1193, Alfonso married Gersenda II of Sabran, daughter of Rainou, Count of Forcalquier and Gersend of Forcalquier. They had a child who became Ramon Berenguer IV as Count of Provence. According to explanations in the manuscripts of Gaucelm Faidit's poems, Alfonso was a rival of the troubadour's for the love of Jourdaine d'Embrun. [S746] Wikipedia, online http://Wikipedia.com, http://en.wikipedia.org/wiki/Alfonso_II,_Count_of_Provence. Biography*: Aymer (also Aymar, Adhemar or Adomar; c. 1160 – 16 June 1202) was the last Count of Angoulême of the House of Taillefer. He was the third of the six children of Count William IV and Marguerite de Turenne. His two elder brothers, Wulgrin III and William VII, became the Counts of Angoulême in succession after the death of their father in 1179. Aymer succeeded his brother in 1186, and soon after was at the court of Richard the Lionheart, then Duke of Aquitaine and thus Aymer's lord, to receive recognition of his accession. By 1191, Aymer had married Alice of Courtenay, the daughter of Peter I of Courtenay and thus granddaughter of King Louis VI of France. In 1188, they had a daughter, Isabella of Angoulême, who married King John of England in 1200. The marriage alliance was sealed by two treaties, one public, the other private between Aymer and John. The count remained a steady ally of the kings of England against the rebellious House of Lusignan. Aymer had a claim to the County of La Marche, where in 1199 or 1200 he was exercising authority, perhaps on behalf of his son-in-law, and issued a charter to some monks of Aubignac. In February 1202 when John was visiting Angoulême to negotiate a treaty with Sancho VII of Navarre, Aymer took him on a tour of the newly consecrated abbey church at La Couronne. The role of Aymer's daughter in John's continued refusal to properly care for his brother Richard the Lionheart's widow, Berengaria of Navarre, may explain the Count of Angoulême's proximity to the negotiations between the two kingdoms. Aymer died in Limoges on 16 June 1202. His daughter and only child succeeded him as Countess of Angoulême. Her title, however, was largely empty since her husband denied her control of her inheritance as well as her marriage dowry and dower. John's appointed governor, Bartholomew de Le Puy (de Podio), ran most of the administrative affairs of Angoulême until John's death in 1216. In 1217 Isabella returned and seized her inheritance from Bartholomew, who appealed unsuccessfully to the English king for help. She is also known as Alix de Courtenay. Alice was born in 1160, the second eldest daughter and one of the ten children of Peter I of Courtenay and Elisabeth of Courtenay, daughter of Renauld de Courtenay and Hawise du Donjon. Her family was one of the most illustrious in France; and her paternal grandparents were King Louis VI of France and Adélaide de Maurienne. Her eldest brother Peter became the Latin Emperor of Constantinople in 1216. In addition to Peter, she had three more brothers, Philippe de Courtenay, Robert, Seigneur of Champignelles, and William, Seigneur of Tanlay; and five sisters, Eustacie, Clemence, Isabelle, Constance, and another whose name is unknown. In 1178, she married her first husband, Guillaume I, Count of Joigny. The marriage did not produce any children, and they were divorced in 1186. A charter dated 1180 records that Count Guillaume, with Alice's consent, donated property to Pontigny Abbey. Isabella of Angoulême (1188 – 31 May 1246), married firstly 24 August 1200 King John of England, by whom she had five children; in spring 1220, she married secondly, Hugh X of Lusignan, Count of La Marche, by whom she had another nine children. Alice's husband died on 16 June 1202. Their only child, Isabella succeeded him as suo jure Countess of Angoulême. By this time, Isabella was already Queen of England. Biography: Margaret Graham, Countess of Menteith (1334–1380) was a Scottish noblewoman. She married four times, becoming Countess of Menteith and, in 1361, Duchess of Albany. Her fourth and last husband was Sir Robert Stewart, 1st Duke of Albany, who would go on to be Regent of Scotland from 1406 until his death in 1420. Her son Murdoch Stewart would become the second Duke of Albany, but was executed for treason by King James I of Scotland in 1425. Margaret Graham was the only daughter of Sir John Graham and Mary Menteith, Countess of Menteith. She was born in Doune Castle, Stirlingshire, Scotland. Margaret's father served as second-in-command to Sir William Wallace, fighting alongside Wallace during the Scottish Wars of Independence. He was killed at the disastrous Battle of Falkirk on 22 July 1298, when the Scottish army was routed by Edward I of England. She was married four times. First, to Sir John Moray, Lord of Bothwell (son of Sir Andrew Moray and Lady Christina Bruce). No issue. Then she was married to Thomas, 9th Earl of Mar but they were divorced circa 1359. No issue. Thirdly, she was married to Sir John Drummond of Concraig. No issue. Her last marriage in 1361 was to Sir Robert Stewart, 1st Duke of Albany (son of Robert II Stewart, King of Scotland and Elizabeth Mure of Rowallan). Sir Robert Stewart was a member of the Scottish Royal House and later served as regent to three different Scottish monarchs. Murdoch Stewart (1362–1425), 2nd Duke of Albany (married to Joan Douglas and later to Isabel, Countess of Lennox). Margaret Graham’s married name evolved from Moray to Erskine to Drummond and later to Stewart. [S746] Wikipedia, online http://Wikipedia.com, http://en.wikipedia.org/wiki/Margaret_Graham,_Countess_of_Menteith. Biography*: He was created 1st Earl of Atholl [Scotland] circa 1320. He lived at Moulin, Perthshire, Scotland. He fought in the Battle of Halidon Hill on 19 July 1333 at Halidon Hill, Scotland. John was the son of Sir Neil Campbell by his wife Mary Bruce. His grandparents were Sir Cailean Mór Campbell, Afraig of Carrick, Robert de Brus, 6th Lord of Annandale and Marjorie, Countess of Carrick. In 1316 he inherited from his father the lands confiscated from David Strathbogie, and in about 1320 he was created Earl of Atholl, though Strathbogie's son also claimed the title. He was married to Joan, former wife of Malise IV, Earl of Strathearn and daughter of Sir John de Menteith. Her paternal grandparents were Walter Bailloch and Mary I, Countess of Menteith. They had no children, so when he was killed at Halidon Hill on 19 July 1333 (one of five Scottish earls to die in the battle), his earldom became extinct. [S746] Wikipedia, online http://Wikipedia.com, http://en.wikipedia.org/wiki/John_Campbell,_Earl_of_Atholl. Biography*: Sir John de Menteith (c. 1275 – c. 1323) was a Scottish nobleman. He was born to Mary, Countess of Menteith and her husband Walter "Bailloch" Stewart, Earl of Menteith jure uxoris. He and his older brother, Alexander, Earl of Menteith, replaced their paternal Stewart surname in favour of Menteith, which earned him the nickname Fause (False) Menteith. John possessed the land of Ruskie, Stirlingshire. He was Governor of Dumbarton Castle, an appointment made by Edward I who was keen to secure the fortification as a major access route into Scotland by sea. Tradition has it that Menteith betrayed Sir William Wallace to English soldiers, which led to Wallace's death and his later nickname Fause Menteith ("Menteith the treacherous"). There was he quartayrd and undone." The English chronicler Piers Langtoft states that Menteith discovered the retreat of Wallace through the treacherous information of Jack Short, his servant, and that he came under cover of night and seized him in bed. A passage in the Scala Chronica, quoted by John Leland, notes, "William Walleys was taken of the Counte of Menteith, about Glasgow, and sent to King Edward, and after was hanged, drawn, and quartered at London." The tomb effigies of Walter and his wife, Mary, at Inchmahome Priory in Menteith. Biography*: Walter "Bailloch" otherwise Walter "Bailloch" Stewart (1225/1230 – 1293/1294), he was distinguished by the sobriquet Bailloch or Balloch, a Gaelic nickname roughly translated as "the freckled". He was the Earl of Menteith jure uxoris. Walter was a younger son of Walter Stewart, 3rd High Steward of Scotland, and his wife Beatrix of Angus, daughter of Gilchrist, Earl of Angus. In 1258-59, Walter accompanied Louis IV of France on his Crusade, according to tradition. After the death of King Alexander II of Scotland he was aligned with the "English faction", and in 1255 secured the persons of the young King and Queen, but he was not at this time allowed to a share in the government. About 1260, when the Countess Isabella and her husband were forced to leave Scotland, the magnates of Scotland arranged the marriage of her sister, Mary, to Walter Stewart, who took possession of the lands and title, with questions of legal ownership being reserved. He was certainly using the title of Earl (jure uxoris) before 17 April 1261, when he was witness to a grant to the Paisley Abbey. In the following year Dughall MacSuibhne (MacSween) granted to the Earl the lands of Skipnish, Killislate, and others, being that part of Kintyre called South Knapdale and the parish of Kilcalmonell. Following on this, the Earl granted the church of Kilcalmonell to the monks of Paisley. He also made grants to Kilwinning Abbey of churches in Knapdale, which show that he had possession of North Knapdale also. About 1263 the Earl was Sheriff of Ayr, and aided in making preparations to repel the expected invasion of King Haakon IV of Norway. He and his brother Alexander Stewart, 4th High Steward of Scotland were joint commanders of the Scots in the Battle of Largs. The Earl was Sheriff of Dumbarton in 1271. On 25 July 1281 he was one of the witnesses to and guarantors of the marriage contract of the Princess Margaret with Eirik II of Norway. He, Countess Mary, and a party of Scots barons traveled to Norway accompanying the princess and her dowry of fourteen thousand marks. In 1285 he and his Countess were again attacked by the rival claimants Walter Comyn and his wife Isabella, their claim having been in 1282 pressed upon King Alexander III of Scotland by the English King, and in a Parliament at Scone it was decided that the earldom should be divided into two portions. One half was retained by Walter Stewart, with the title of Earl, and the other half was erected into a barony for William, the son of John the Red Comyn, and his wife, a daughter of the elder countess by her first husband. The component parts of the earldom which remained to Walter Stewart are not known. The death of King Alexander in 1286 threw the kingdom again into confusion, and during the rivalry which ensued between the parties of Bruce and Balliol, the Earl of Menteith supported the cause of Bruce. In 1289 he was present at Birgham, and approved of the marriage proposed between Prince Edward of England and the young Margaret, Maid of Norway as she was called, the heiress of the Scottish Crown. Her unhappy death renewed the contest between Bruce and Balliol, and when it was proposed that the King of England should arbitrate, Menteith was one of those named by Bruce as his commissioners. He was present at Norham on 20 November 1292 when the new king John Balliol swore fealty to Edward I of England. This is the last certain record of him, as although letters were addressed by the English King to Walter Stewart, Earl of Menteith, on 29 June 1294, it is not clear that he was then alive. He may even have been dead by 10 February 1293, when Balliol's Parliament directed the lands of Knapdale belonging to the Earl to be incorporated in the sheriffdom of Lorn under Alexander of Argyll. The Countess Mary predeceased her husband, probably before 1286. Their tombstone is preserved in the Priory of Inchmahome, bearing the effigies of husband and wife, the former bearing on his shield the Stewart fess chequy with a label of five points, a device which also appears on his seal of arms in the Public Record Office, London. Alexander, Earl of Menteith, who succeeded to the earldom. [S746] Wikipedia, online http://Wikipedia.com, http://en.wikipedia.org/wiki/Alexander,_Earl_of_Menteith. [S742] The Peerage, online thepeerage.com, http://en.wikipedia.org/wiki/Mary_I,_Countess_of_Menteith. [S746] Wikipedia, online http://Wikipedia.com, http://en.wikipedia.org/wiki/Walter_Stewart,_Earl_of_Menteith. The tomb effigies of Mary and her husband, Walter Bailloch, at Inchmahome Priory in Menteith. Biography*: Maire inghean Mhuireadhaich or Mary, daughter of Muireadhach II, Mormaer of Menteith, was Countess of Menteith, successor to her sister Isabella (Iosbail). She inherited the title from her father, and married Walter Bailloch, son of Walter Stewart, 3rd High Steward of Scotland. By the time of the death of Walter Comyn, Lord of Badenoch, jure uxoris Earl of Menteith in 1258, she may have already been married. In 1260, Isabella was arrested (along with her new husband, an English knight called John Russell) for the poisoning of her late husband; by the month of April 1261, Walter and Mary were ruling the province as Count and Countess.